How did we get to a point where choosing a job depended on which offered the best health care plan? This is the reality for many people living in the U.S. today. As a nation we spend twice as much per capita on health insurance as any other developed country at 17% of our GDP. Despite this massive spending, the life expectancy in the U.S. is under 79 years while in the UK, Canada, and Australia it is around 81 years! The key difference? Those countries have universal healthcare and we do not. Workers in the U.S. are spending on average 10% of their income on health care and most people have less than $1,000 in savings. Given this reality, something like a medical emergency could put most people in huge amounts of debt. There is really no need for health care costs to be the thing that drains a family’s life savings. On top of that, what we pay for insurance often feels like money in the trash when we actually want to use the benefits supposedly covered by our insurance. Outrageous co-pays and deductibles force people to choose whether or not they can even afford to take a trip to the hospital or pharmacy. Gone are the days when a good job meant good health care along with it. The skyrocketing costs of health care are being forced on working people – but why are costs going up? At every stage, private profits nudge up costs. So when a pharmaceutical company raises prices to increase its profit margin, the health insurance company increases what it charges, as do the pharmacies – each trying to get a little bit more profit out of the deal. And we are forced to pay for it all. Winning free health care is not a pipe dream like establishment politicians make it out to be. How would it be paid for? First of all, we should tax the rich. But Medicare for All also means eliminating the insurance companies and this would significantly reduce overall administrative costs. One study estimated that a Medicare for All single payer system would reduce administrative costs by $375 billion! But we should go further than this and take the profit motive out the healthcare system completely by bringing the huge pharmaceutical companies and hospital chains into public ownership and democratic control. This is how we ensure that life-saving procedures and medicine can be available to everyone and won’t be given or denied based on what will make the most money for health care tycoons. Both Democrats and Republicans get huge campaign donations from big pharma and insurance companies. It’s great that some Democrats are now rejecting corporate money, including money from big pharma, but that’s not enough. There needs to be a massive campaign to force Nancy Pelosi and the new Democratic majority in the House of Representatives to follow the lead of Bernie Sanders and Alexandria Ocasio-Cortez and pass a Medicare for All bill this year. 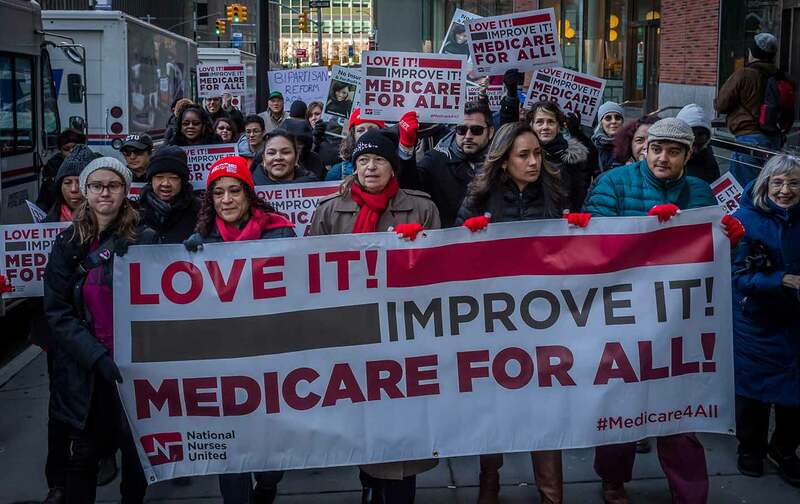 At state level, especially in key Democratic-run states like California and New York, we need mass campaigns to force them to pass single payer, Medicare for All at the state level. In order to win Medicare for All and other vital changes, we can’t rely on the Democrats. Unions have a key role to play. My union IBEW Local 103 in Boston took an important step. We felt that the politicians in the State House did not have the workers interest at heart and pulled our campaign money out of their coffers. But that leaves open the question, who would we support? Rather than waiting to see what candidate is put up by either the Democrats or Republicans – we should run our own candidates! Candidates that are not millionaires but regular people that make regular wages so they understand what regular people go through. If the unions supported and funded their campaigns and built structures to hold their candidates accountable, they would be beholden to them and not to the big corporations that support the corrupt politicians we see in Congress today. To pull this off, we need a new political party for working people that we build ourselves. We need a real transformation of our health care in the United States. We need to tax the rich and corporations to fund Medicare for All and we need to take the huge medical corporations into public ownership so that decisions about health care are made democratically and not in the interests of profit. We need to hit the streets and build a movement for Medicare For All! Previous articleVenezuela: For Mass Mobilization of Workers to Build Real Socialism and Put an End to Corrupt Bureaucracy!